Home sales typically slow during the winter months, but Pacific Union’s real estate markets in the Bay Area and Tahoe/Truckee have stayed busy through January (and on into February), with buyers eager to make purchase offers even as the inventory of available homes remained exceptionally tight. All of our regions reported strong sales activity in January as measured by the percentage of homes in contract. Typically, more than 35 percent of homes in contract indicates a sellers’ market and less than 25 percent reflects a buyers’ market. A balanced market has 25 to 35 percent of homes in contract. Other measurements, such as median sales price and months’ supply of inventory, also reflect market activity. Click for the full report. The supply of available homes in Contra Costa County continued to shrink in January, pushing the percentage of homes in contract to 59 percent, the highest level in the county in years and among the highest of Pacific Union’s eight Northern California regions. In several cities it was even worse: 70 percent in contract in Concord, 68 percent in Pleasant Hill, and 66 percent in Martinez, San Ramon, and Walnut Creek. At the other end of the scale, communities with a balanced market included Blackhawk, with 29 percent of homes in contract, and Moraga, with 33 percent. Homes priced from $100,001 to $500,000 were the most active market segment; they accounted for nearly one-third of available homes, and 77 percent of them were in contract. From there, market segments moved toward more balanced levels as home prices increased. See the full Contra Costa County monthly market update. By the end of January, the percentage of homes in contract in the East Bay had hovered between 48 and 49 percent for four straight months, evidence of a sustained sellers’ market. The most active neighborhoods last month were those in ZIP code 94611, including Montclair, with 50 homes on the market and 46 percent of them in contract. Other busy Oakland neighborhoods included those in ZIP code 94619 (Redwood Heights and Skyline/Hillcrest Estates), with 63 percent of homes in contract, and 94602 (Dimond, Oakmore, and Glenview), where 47 percent of homes were in contract. Berkeley also was active, with 42 homes for sale and 49 percent of them in contract. By price, 61 percent of East Bay homes priced $100,001 to $500,000 were in contract. See the full East Bay monthly market update. Marin County’s housing market has been tightening over the past few months, but the percentage of homes in contract remains the lowest in the Bay Area at 40 percent. That gives buyers a bit more room to negotiate a deal. In Belvedere, Ross, Sausalito, and Tiburon, the percentage of homes in contract was below 25 percent, evidence of buyers’ markets. San Rafael and Novato had the most homes for sale, 39 and 33, respectively. In both cities, the housing supply was split almost evenly between homes priced under $1 million and over $1 million. Countywide, more than two-thirds of homes on the market (68 percent) were priced above $1 million, including 21 in Tiburon, 17 in San Rafael, 16 in Novato, 14 in Belvedere, and 13 in San Anselmo. See the full Marin County monthly market update. Napa County was home to two very different housing markets in January. The city of Napa was a sellers’ market by a wide margin, with 73 percent of the 273 homes on the market in contract. But the market was reversed in St. Helena, where only 15 percent of 124 homes were in contract, putting buyers in the driver’s seat. It was a similar story in Calistoga, where only nine of 77 homes (12 percent) were in contract. Countywide, 48 percent of homes were in contract, though virtually every home priced from $100,001 to $500,000 was spoken for. In fact, 124 percent of homes priced from $100,001 to $500,000 were in contract, owing to deals not yet completed from the previous month. See the full Napa County monthly market update. Southeast San Francisco had the greatest supply of homes for sale in January, with 199 in District 9 (South of Market, Inner Mission and Bernal Heights neighborhoods) and 136 in District 10 (Bayview, Visitacion Valley) – nearly 40 percent of the city’s total (869). The fewest homes for sale were in District 3 (Ingleside, Stonestown, and Merced Heights), with 27 on the market. The percentage of San Francisco homes in contract reached 40 percent in January, the highest level in years. The tightest markets were for homes priced from $3 million to $4 million (eight of 15 homes in contract, or 53 percent) and from $750,000 to $1 million (79 of 162 homes in contract, or 49 percent). The greatest number of homes were priced from $500,000 to $750,000 (246), followed by $100,000 to $500,000 (182), and $750,000 to $1 million (162). See the full San Francisco monthly market update. Homebuyers remained busy throughout January in Sonoma County, resulting in 63 percent of homes on the market going into contract — the highest level in years and the highest among Pacific Union’s eight Northern California regions. The market was even tighter in the county’s largest cities, with 85 percent of available homes in contract in Rohnert Park, 71 percent in Petaluma, and 69 percent in Santa Rosa. Cities with the lowest percentage of homes in contract were in the Sonoma Valley: 18 percent in Glen Ellen and 25 percent in Kenwood. Nearby, the city of Sonoma had 48 percent of homes in contract. Across the county, 71 percent of homes priced under $1 million were in contract in January, with 13 percent in contract among homes priced above $1 million. 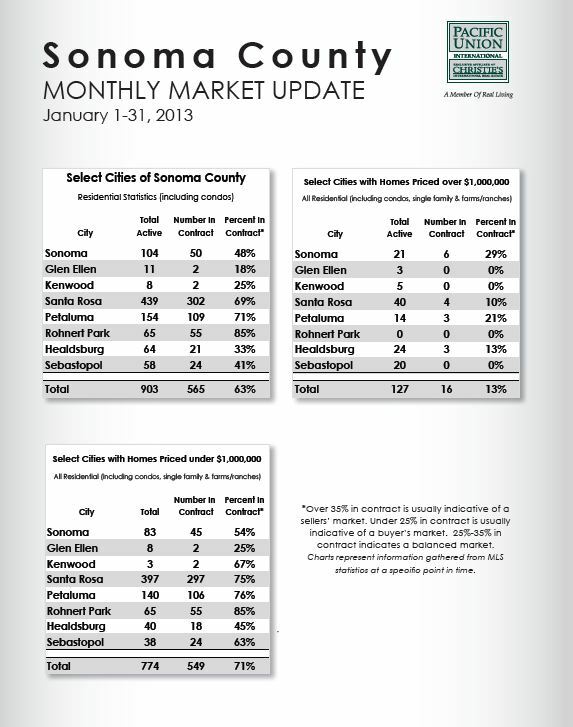 See the full Sonoma County monthly market update. Roughly a third of all homes priced from $500,001 to $1 million were in contract, as were four of the five homes priced from $1.25 million to $1.5 million. The North Lake Tahoe area had the greatest number of homes for sale, 69, followed by Northstar with 43, Donner Lake (14), Alpine Meadows (11), and Martis Camp (9). See the full Tahoe/Truckee monthly market update. Previous PostPrevious Zillow, Trulia, Move: Show Us the Money!